A record or statement of financial expenditure or receipts relating to a particular period or purpose. The act of confirming that the balance in one’s checkbook matches the corresponding bank statement. The total depreciation on a tangible asset accumulated up to a specified date. This amount is subtracted from the original cost or valuation of the asset to arrive at its book value. The book credit leveraged against the fiduciary assignment of a company’s receivables. An organization of people with a common purpose and having a formal structure. An analysis of a company’s assets, liabilities and equity usually conducted at set intervals, such as quarterly or annually. The point at which the income from the sale of a product or service equals the invested costs, resulting in neither profit nor loss; the stage at which income equals expenditure. The process in Government Accounting of recording budgetary amounts in the accounts of a fund. Interest that is not immediately expensed, but instead is treated as an asset and amortized over time in the income statement. The length of time between the purchase of raw materials and the collection of accounts receivable generated in the sale of the final product. The total amount of money being transferred into and out of a business, especially as affecting liquidity. The declaration by a creditor (usually a credit card account) that an amount of debt is unlikely to be collected. This occurs when a consumer becomes severely delinquent on a debt. A created list of the accounts used by a business entity to define each class of items for which money or the equivalent is spent or received. The belief that business systems should follow a safe approach to business practices. An agreement between two or more parties to do or not do something specified. The deduction of a payment made by a debtor from an amount due. Any asset expected to last or be in use for less than one year. Obligations such as deferred dividend, trade credit, and unpaid taxes, arising in the normal course of a business and due for payment within a year. Something, typically money, that is owed or due. A company or individual that owes a sum of money. Revenue that is considered a liability until it becomes relevant to the business at hand, such as a payment received for work that has not yet been performed. Name given to an account that records the sums (accounts) whose collection looks uncertain. Such accounts are termed “bad debts” and are usually written off against the profit of the firm as expense. A person or business that employs one or more people, especially for wages. 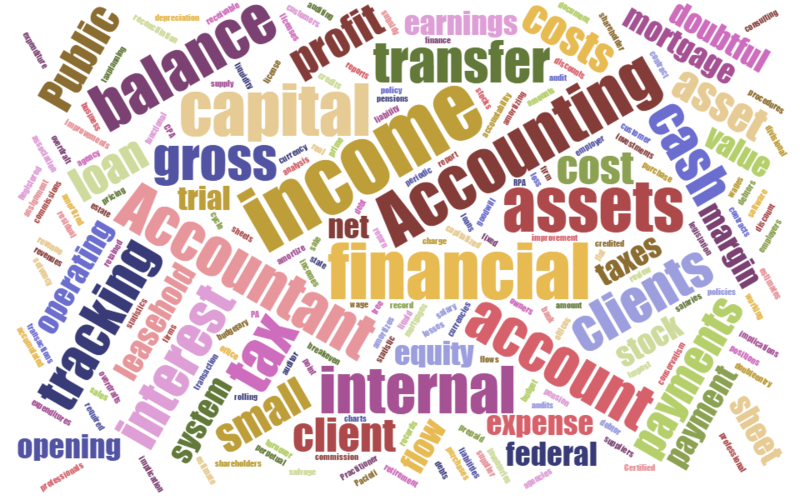 Total assets minus total liabilities; also called net worth or book value. The act of expending something, especially funds; disbursement; consumption. Pertaining to or of the nature of a union of states under a central government distinct from the individual governments of the separate states. The management of revenues; the conduct or transaction of money matters. A document showing credits and debits. A periodic cost that remains more or less unchanged irrespective of the output level or sales revenue, such as depreciation, insurance, interest, rent, salaries and wages. The amount of cash that a company has left over after it has paid all of its expenses, including investments. Currency of the country (called the “primary environment” ) in which a firm conducts its business activities and generates most or all of its income and expenses. An intangible asset that arises as a result of the acquisition of one company by another for a premium value. Sales minus all costs directly related to those sales, including manufacturing expenses, raw materials, labor, selling, marketing and other expenses. Reputation, name recognition, and intellectual property such as knowledge and know how. The amount allocated for interest payments made by a company. The action or process of investing money for profit. A physical improvement made to a facility by a lessee that enhances the value of the facility. An obligation that legally binds an individual or company to settle a debt. Authorize the use, performance, or release of something. Assets in the form of cash. The availability of liquid assets to a market or company. A sum of money borrowed and expected to be paid back with interest. The result of selling assets for a price lower than the original purchase price. The difference between a sale price and a cost. An excess of a company’s actual sales revenue over the breakeven sales revenue, usually expressed as a percentage. A debt instrument that is secured by the collateral of specified real estate property and that the borrower is obliged to pay back with a predetermined set of payments. The total revenue in an accounting period minus all expenses during the same period. The new amount on their balance sheet after financial statements are completed. An expense incurred in carrying out an organization’s day-to-day activities, but not directly associated with production. A loan arrangement under which a bank extends credit up to a maximum amount against which a current checking account customer can write checks or make withdrawals. A regular payment made during a person’s retirement from an investment fund to which that person or their employer has contributed during their working life. A system where a business calculates its inventory by physically counting items at end of each accounting period rather than updating inventory continuously. A system where a business updates the quantity and availability of its inventory on a continuous basis, after each purchase or sale. The direct cost of a commodity in terms of the materials and labor involved in its production, excluding fixed costs. Acquisition through the payment of money or its equivalent. Estimated scrap value of an asset at the end of its economic or useful life. Profit generated by a company that is not distributed to shareholders as dividends but is either reinvested in the business or kept as reserve for specific objectives. A measure of a company’s financial performance, equal to net income divided by the sum of fixed assets and net working capital. Money spent by a company for the purpose of managing the business and/or for operating machinery for use in the business. A fixed amount periodically paid to a person for regular work or services. A unit of account for the capital or stock of a company. An owner of shares in a company. The ability to meet maturing obligations as they come due. The capital raised by a business or corporation through the issue and subscription of shares. Equipment, machinery, plant, property that has long-term physical existence or is acquired for use in the operations of the business and not for sale to customers. A compulsory contribution to state revenue, levied by the government on workers’ income and business profits or added to the cost of some goods, services, and transactions. The price that is assumed to have been charged by one part of a company for products and services it provides to another part of the same company, in order to calculate each division’s profit and loss separately. A statement of all the open debit and credit items in a double-entry ledger, made to test their equality. A periodic cost that varies in step with the output or the sales revenue of a company. Variable costs include raw material, energy usage, labor, distribution costs, etc. Money that is paid or received for work or services, as by the hour, day, or week.